We have 12 shops across Northern Ireland that can help to recycle your unwanted goods into funds to support our vital services. Drop your items into your nearest store or find out more about our onsite Drop In Box scheme that makes clearing out your closet and supporting your local charity even easier! Find our more about what we can and can’t sell here. All our shops are open Monday to Saturday, 9.30am to 5pm. Volunteers make a vital contribution to our work, bringing additional skills and knowledge. 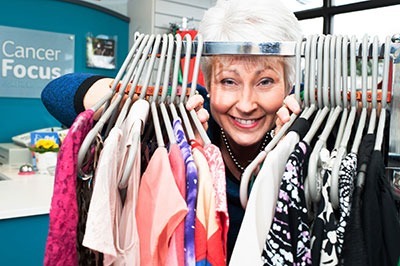 Our shop volunteers help with visual merchandising, window displays, point of sale and styling – a great opportunity to gain new skills and experience within the retail sector. By donating a few hours per week you can make a real difference. If you’re interested contact your local shop manager or Morag Chambers on moragchambers@cancerfocusni.org or 028 9066 3281.